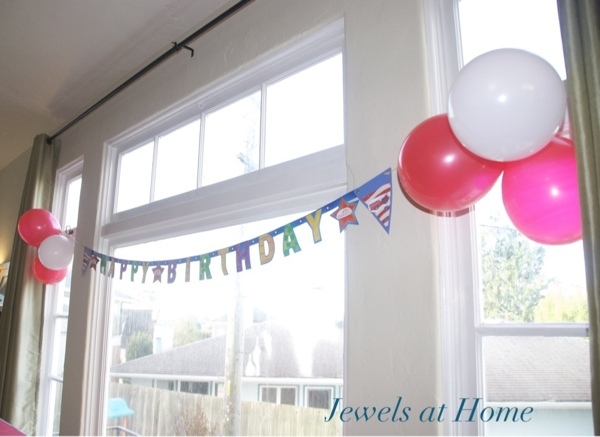 I often see beautiful birthday banners customized for a theme party. I love having something that matches the rest of the event and makes the birthday boy feel all the more like the day is made just for him. On the other hand, I don’t love the idea of something that can be used just once. So, I’m very happy that I realized that you can adapt any banner to a theme… And then just as easily change it for the next party. I can’t resist poking around the clearance shelves at Target and was excited to recently find a colorful birthday banner in red, yellow, and blue. The colors were perfect for our upcoming firefighter birthday, but the circus animals were not. But for just $1.54 (!! ), I knew I couldn’t make anything like it myself, and it wouldn’t be a big project to cover up the circus animals with something new. 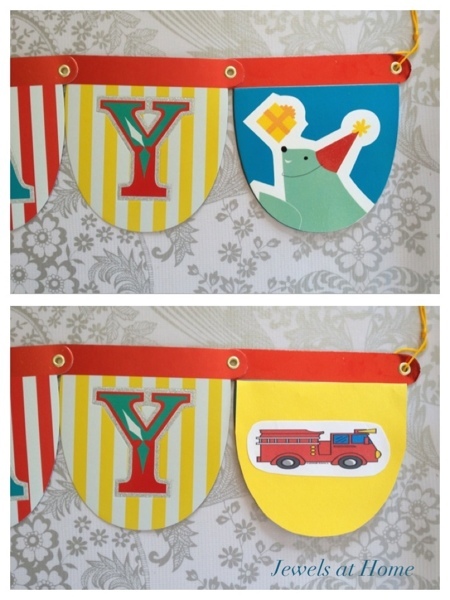 Here’s a picture of the original banner (top) and then the way it looks after I simply added yellow cardstock and a picture of a fire truck (bottom). I used painter’s tape to attach the new decorations, so they can be removed easily without damaging the banner underneath. You can easily change the theme of a party banner to reuse it! Why didn’t I think of this before? Firefighter birthday party decorations. 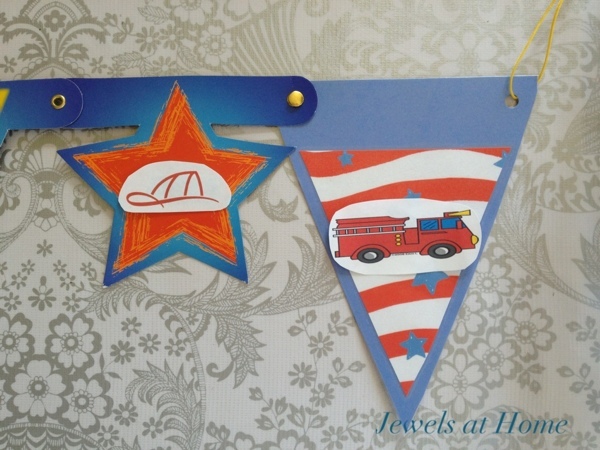 So easy to reuse this banner by changing from a circus theme to a firefighter theme. Once I changed the new banner, I got the idea to update another one I’ve has for years. It’s a very simple design that would go with anything. The original banner had stars between the letters didn’t have a lot of space for customization, so I decided to make extra pennants to add on the ends. I just cut triangles out of blue cardstock to match the rest of the banner and glued smaller triangles of a patterned paper. I covered the triangles with clear contact paper, so that things could be taped on the surface and then removed. I punched two holes in the top of the pennant and used a simple brad (an office supply “brass fastener”) to join it to the existing pennant. 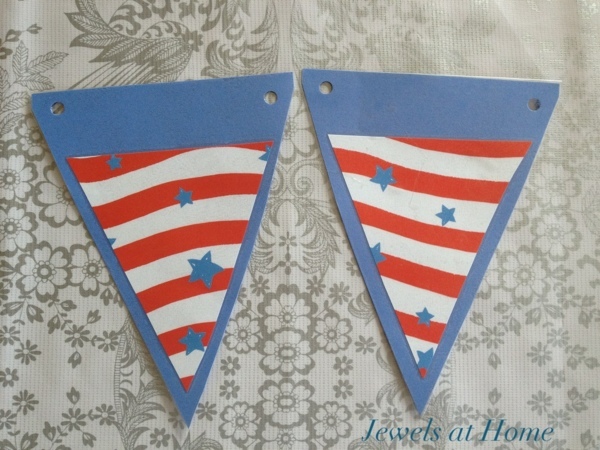 Making pennants for a birthday banner. Cover the paper with clear contact paper, so decorations can be switched out according to the party’s theme. 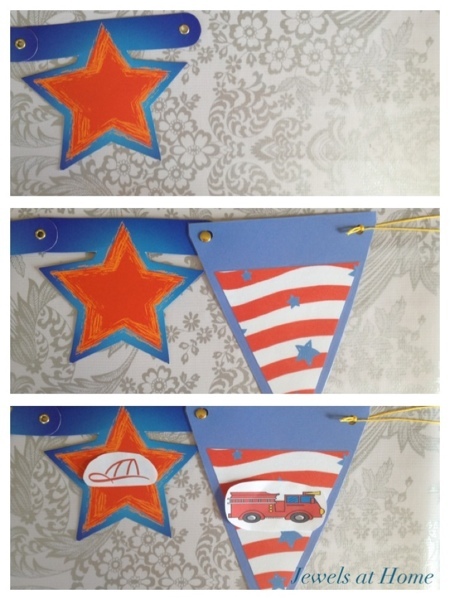 Add extra pennants to a ready-made banner, to give you more room for customizing your theme. For baby J’s party, I added firetrucks again, but these can be taken off and switched to something new for our next party! Customize a plain banner with removable decorations. This banner can be used over and over again! 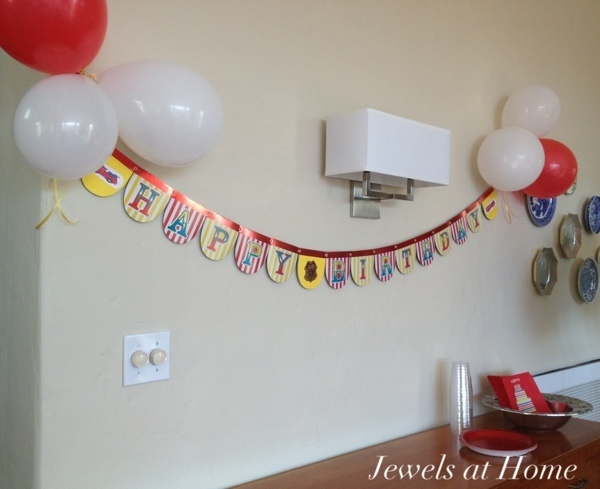 A plain banner customized for a firefighter birthday using removable decorations. This banner can be used over and over again for different parties! Yes, this is a simple idea, but it’s a great addition to our party repertoire that I can now re-use and customize at the same time! I’ll put together the rest of the firefighter party pictures to post soon.